Ceramicist Jeremy R. Brooks is currently based in Carbondale, Illinois, where he's teaching at Southern Illinois University. His own studies include an unusual type of clay with a rubber-like elasticity that sets up quickly. Working quickly, he extrudes paper-like slabs and long coils, which he can then use for knitting, weaving or crocheting. The resulting forms have a plasticity that seems nearly impossible. 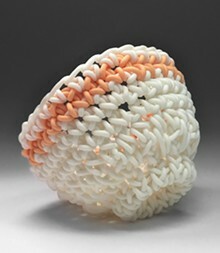 Knitted vessels made from delicate strands of clay, sinuous loops of loosely bunched clay-yarn, a rainbow skein of fibers wrapped around itself that approximates the whorls and shape of a brain — Brooks' work is both trompe l'oeil and trompe l'clay. A small exhibition of Brooks' ceramics go on display this weekend at the Duane Reed Gallery (4729 McPherson Avenue; www.duanereedgallery.com), along with Brian Smith's abstract paintings. The show opens with a free reception from 5 to 8 p.m. Friday, July 20, and remains on display 10 a.m. to 4 p.m.. Tuesday through Saturday through August 31.